New Delhi: Weeks after finance minister Pranab Mukherjee voiced concern about the widening divergence between retail and Wholesale Price Indices, the Union government has set up an inter-ministerial committee to investigate the reasons for the gap, two government officials said. The committee will consider including the same food commodities in the two indices and look into the weights, commodity baskets, divergence in price collection and reporting systems used to compile the two indices. But while the WPI climbed a mere 0.37% in the week to 12 September from a year earlier, after rising 0.125% the previous week, food and other prices have increased sharply for the past several months. 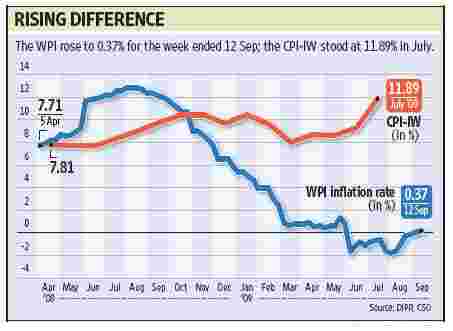 WPI inflation entered positive territory in the first week of September after 13 weeks of negative inflation. According to the latest available data, the CPI-Industrial Workers (CPI-IW) stood at 11.89% in July. In the same period, inflation for primary food articles was 12.09%. The new panel will be headed by P.K. Padhy, senior economic adviser at the department of industrial policy and promotion (DIPP), and will include officials from the finance, statistics and labour ministries as well as from the department of consumer affairs, said a DIPP official who didn’t want to be named. The committee, which will meet in the first week of October, has been asked to submit a report to the ministry of statistics. Earlier this month, Mukherjee had termed the divergence between the two indices “disturbing". “Earlier, the trend was that there used to be some convergence between WPI and CPI inflations after two-three months. But I am not seeing that now," he said. Mukherjee was referring to the negative WPI inflation prevailing until September even as the CPI-IW crossed double digits. A senior official at the National Statistical Commission, the nodal statistical policy making body, said some difference between the indices was inevitable as they were based on two different sets of data. “However, there was some amount of coordination previously. Now the divergence has started to widen. There is an urgency to look into the matter," the official said, asking not to be named. The concern is misplaced, says Abhijit Sen, a Planning Commission member and the chairman of a committee working on a new revised WPI series. “There is no real divergence in the two sets of data. If you look at the food price inflation in the two inflation measures, they are almost (the) same," Sen said. He also said CPI and WPI were unlikely to converge when “on one hand you have drought and on the other hand, recession". India has three consumer price indices catering to different sections—the widely followed price index for industrial workers (CPI-IW), rural labourers (CPI-RL) and agricultural labourers (CPI-AL). Given the low income level in the country, food items constitute a large proportion of the consumption basket, which is reflected in the weights in CPIs of between 46% and 70%. In WPI, food items have only a 27% weight. The fuel group has a weight of 14% in WPI and 6-8% in CPIs. Commodities such as chemicals, basic metals and machinery items, which have a 28% weight in WPI, are not directly included in CPIs. There is also a difference in how the indices treat some data. If a price quotation is not reported by a source, CPIs take into account the annual average price of that item, but WPI considers the data unavailable, a second DIPP official said. The ministry of statistics is currently working on streamlining the three consumer price indices into two, one for rural (CPI-Rural) and the other for urban areas (CPI-Urban). The idea is to ultimately merge these two indices into a unified consumer inflation index called CPI-National. Reserve Bank of India governor D. Subbarao, too, had raised concern over the inconsistency in the two sets of data, holding that this may lead to a suboptimal policy response from the central bank. “Differences in the weights of the items included in the various indices, along with divergence (in) price movements, not only create a wedge between the different inflation measures, but also move them in different directions," Subbarao said in July. “Such divergences in alternative inflation measures complicate the conduct of monetary policy in India," he said. Samiran Chakraborty, head of India research at Standard Chartered Bank, said the divergence between the two measurements was due to the base effect. “The central bank should adopt month-on-month seasonally adjusted inflation measurement for relevant policy decisions," Chakraborty said.